Tell me what to do, everyone. 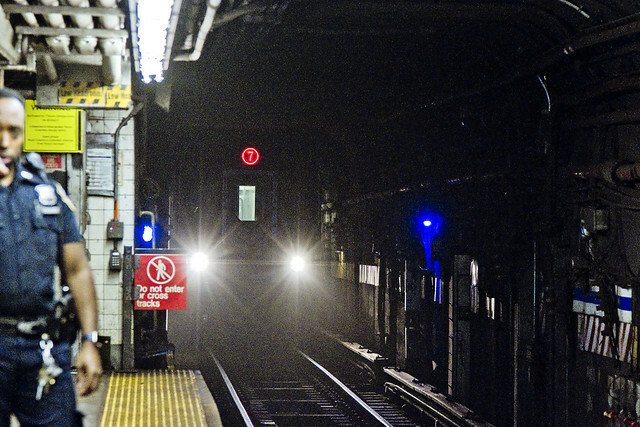 As is my usual habit, while the 7 line Subway was entering the Vernon Jackson Station, the camera was busily clicking away a couple three weeks ago. You’ve seen lots and lots of these shots here at your Newtown Pentacle, as every time I leave the neighborhood on whatever mission the day presents, I document my journeys photographically and that includes getting on the train. Like the Kiwi, I’m a funny and fuzzy little fruit with a lot of personality. On this particular afternoon, the gendarme who had so successfully pissed off his bosses that he was assigned to sit in the cop box at the end of a subway platform in Queens decided to punctuate his obvious boredom by confronting me about taking pictures in “the system.” How retro. Given that I’m overly familiar with not just MTA’s policies towards photographic pursuits on their property (no commercial shoots, camera supports, lights, or flashes without a permit) but NYPD’s (standing orders from former Police Chief Kelly about not harassing photographers) as well, a brief conversation with the officer ensued. He accused me of using a flash, which he claimed “bothered” the conductors. 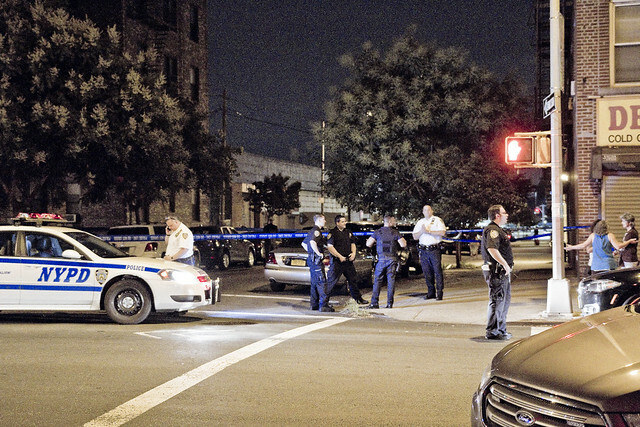 I asked if he saw a camera flash, to which he replied he couldn’t see flashes inside his little cop box. Believe me, if I was using the flash I carry, you’d see it from up on the street. As is my habit, I offered to go with him to the nearby 108th precinct to have a conversation with his Desk Sergeant and Captain Forgione about NYPD’s rules on this subject. The officer declined the opportunity and asked me for ID and to see the pictures I had taken, to which I asked if I had committed a crime. Further, I offered that if he wanted to examine my camera card, he would need a subpoena. He soon realized that he had stepped into a bear trap and returned to his cop box. It’s been a while since I was last hassled by cops for brandishing the deadly weaponry known as a camera. I mean, it’s called a Canon, right? 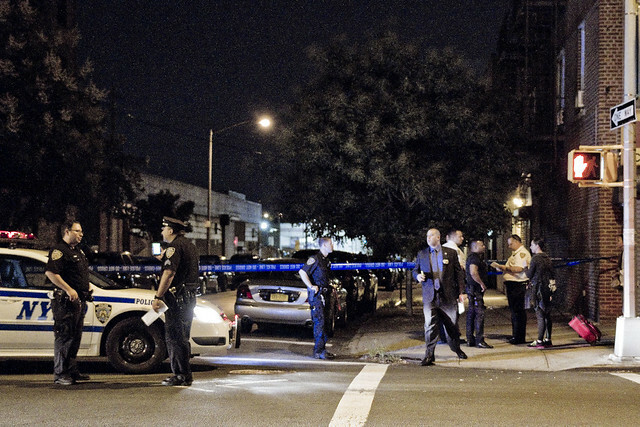 There are no laws in NYC, or in fact the United States, which preclude photographic pursuits in public spaces. There are a few exceptions, to be fair, but they mainly center around military installations. Everytime you see a sign like the one above, simply read it as an abrogation of your constitutional rights. The same legal pretense that allows NYPD and other security oriented organizations to hang surveillance and robotic red light cameras on lamp posts, private businesses and homeowners to brocade their walls with CCTV security cameras, also allows one such as myself to capture images of anything encountered whenever and wherever I want to. A few years back, after reluctantly showing up for Jury Duty, the bailiffs of the Queens County court system went apoplectic when they saw my camera bag. They had no reaction whatsoever to the web connected video camera everybody else was carrying… you know, iPhones… but the DSLR represented some sort of existential threat to them. 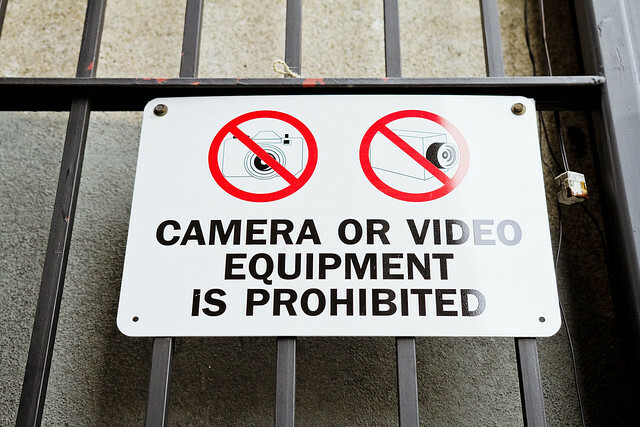 There are rules governing photography regarding private property, as a note. 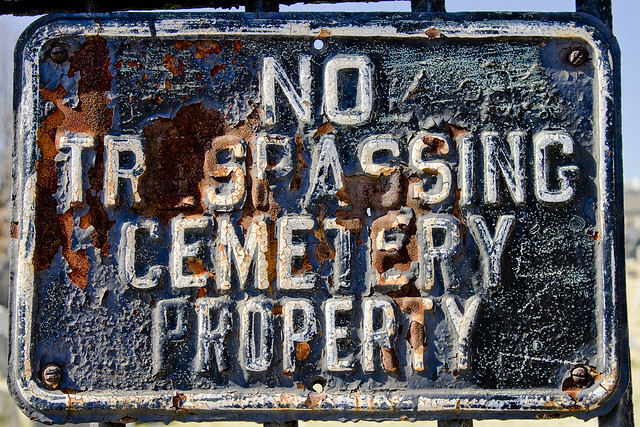 If I wander into a shopping mall, or cemetery, and start clicking away and am then confronted by representatives of the property owner who tell me to cease and desist I am obliged to do so. Again, it’s public space versus private space. If you can see it from the sidewalk, it’s kosher. Photography. Not a crime. Forcing a cop to work inside a box at the Vernon Jackson station might be a human rights violation, however. This fellow should be out there on the streets doing something useful. It’s Congenital Heart Defect Awareness Day, in the Nation of Canada. 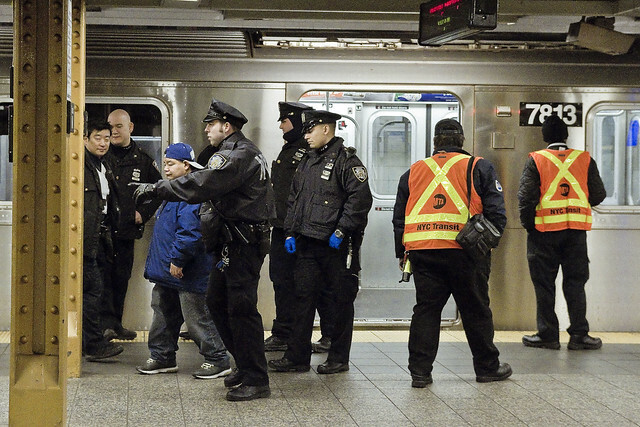 Today, the focus is on the NYPD – the indomitable Police Department of New York City. 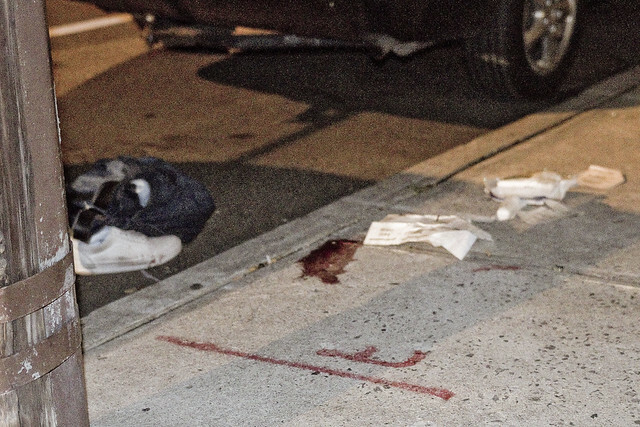 You react one of two ways when the NYPD arrives – you either curse your fate, or you thank your lucky stars they’re there. Most of the cops I’ve known over the years are the very definition of “laconic” when describing their workday lives. World weariness is the consequence of spending your time in the company of those who are having an awful day. It might be the worst day of your life, but to the cops it’s just another day at work. 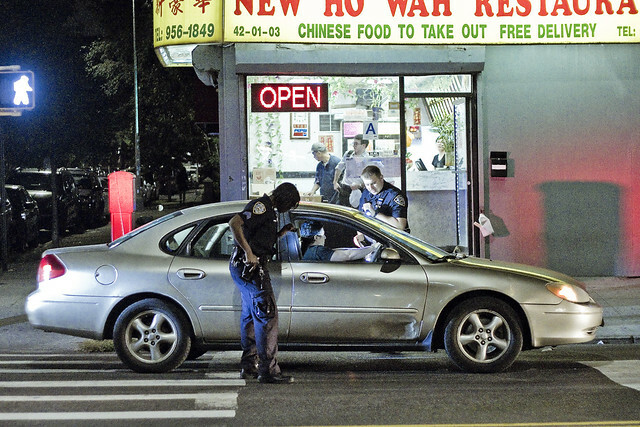 NYPD officers notoriously dislikebeing photographed while pursuing their duties, which is fair enough. Saying that, if they’re in uniform and out in public, anything they do is inherently interesting to one such as myself. Even if it’s the mundane task of removing an inebriate from a subway car in Flushing. 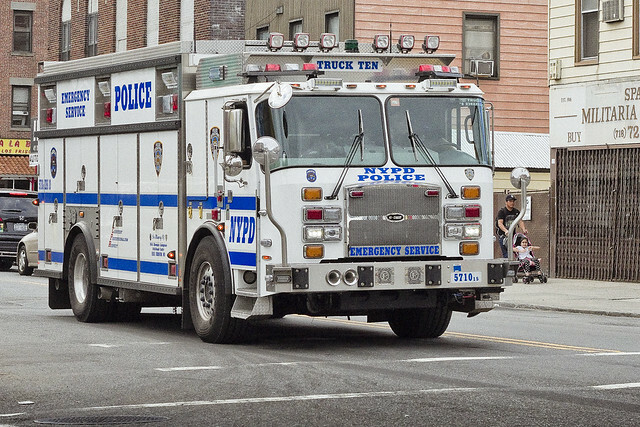 There’s a lot of subdivision units in the NYPD, populated with specialists. The Emergency Services Unit has always held a certain fascination for me. If the regular patrol officer can be analogized to being a soldier, the ESU officer can also be described as being a Special Forces Green Beret or a NAVY Seal. They’re a small army of Batmen. 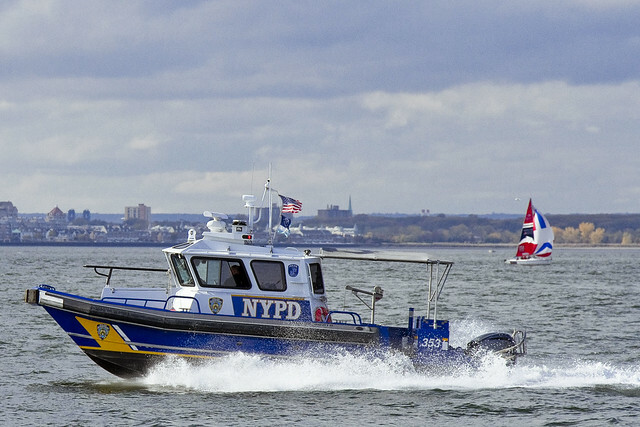 NYPD also maintains a small navy, the Harbor Unit. Seldom commented upon, the harbor unit was originally formed to combat pirates on the East River back in the 19th century. They’re supposed to be outfitted with cutlasses, in addition to side arms, but the modern day crews don’t seem to carry any swords. Thinking it through, in today’s post. The way that the human infestation hereabouts behaves and operates can be described, and made somewhat predictable, via the usage of branch logic. 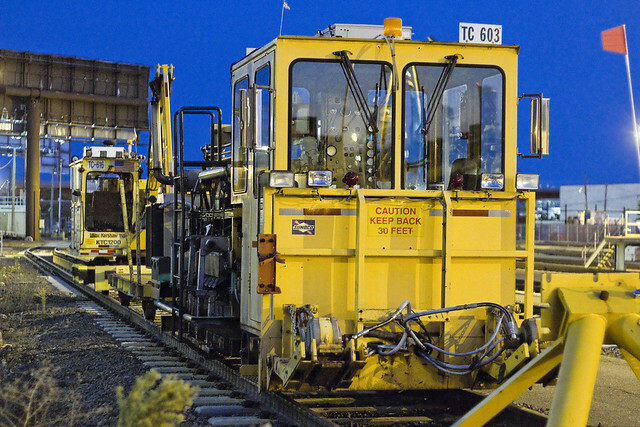 When presented with a decision, you can choose option A or option B – a binary decision. Both have logical next steps. These steps flow out of the original decision, form a branching tree of binary choices – a logical progression of decisions. “If” and “then” and “next” and so on are encountered. A random factor – X – begins to creep into this process around five or six branches down from the original decision. As an example – I decide to punch a guy in the nose, or not. If I hit him, does he a) hit me back, or b) runs away. A, or B form logical progressions that branch out from their individual decision points. Let’s say that the guy hits me back, do I a) punch him again or b) run away crying? If I choose “B,” how far do I run and where do I go? What happens next? You can postulate a few likely, or highly probable steps, but “X” always rears its ugly head eventually. “X” is also known as “unintended consequences,” which is the one predictable constant of every human decision. 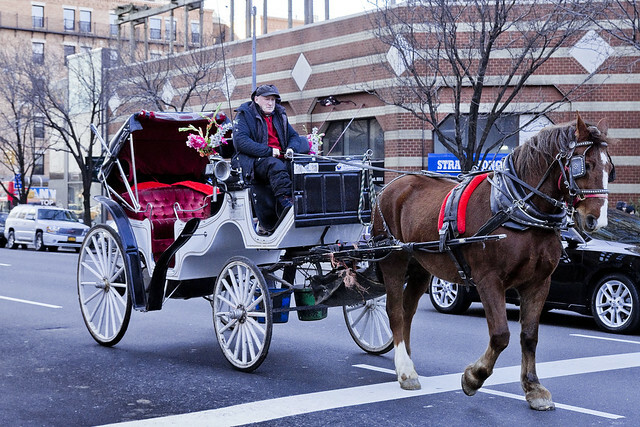 As I’ve mentioned in the past, I’m absolutely fascinated by the Carriage Horse story going on here in the City, wherein our current Mayor has vowed to eliminate the industry from area streets. Animal welfare activists have long opposed the continuing presence of horse drawn carriages on New York streets, citing that the animals are found commingling with automotive and truck traffic. Often, I have pointed out that human children mingle with the self same traffic which is meant to pose this existential threat, but no one seems to care about that. The Carriage industry has accused the Mayor of crass politicking on behalf of a campaign donor, and offers that theirs is a generational craft with long traditions and that their animals are in superb condition. Additionally, they attest that their animals are working creatures who essentially provide for their own needs by pulling these carriages. The NY Daily News is all over this story, and I’d suggest swinging over to their site to check their take out. I’ve no skin in this game, but for some reason I remain enthusiastically attentive to it. 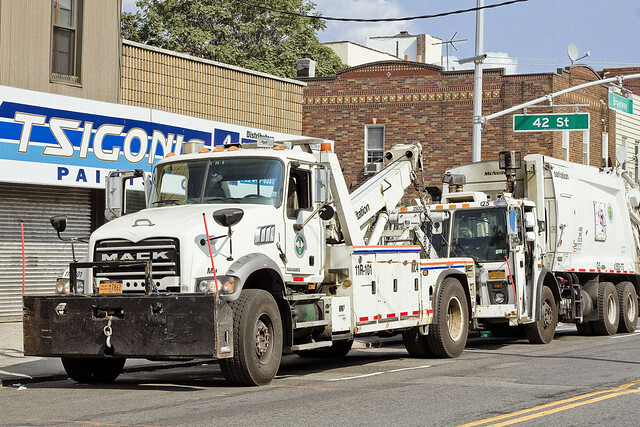 Anyway, that’s the decision which faces the Big Little Mayor – eliminate the Carriage Horse industry or keep it around. A binary decision, ultimately, which will become diluted and colored Legislative Gray somewhere down the tree of “If’s” and “And’s.” As always, one such as myself has nothing but free time to worry about things that really don’t concern me, and a certain driving thought manifested while I was working down the logical tree. It was a simple question that emerged behind my fevered brow. What about the Police Horses? 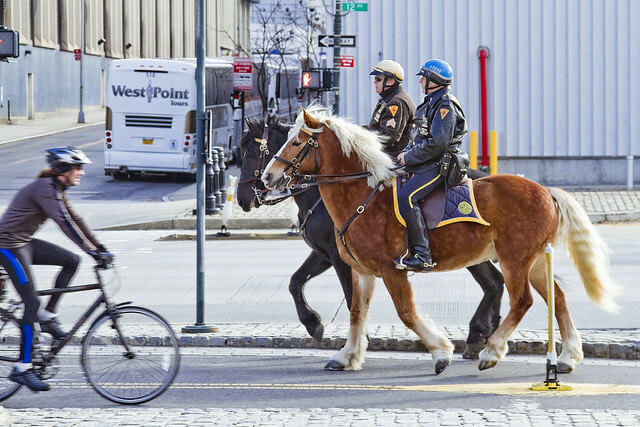 It occurs that I have never, not once, heard anyone complain or protest about the use of horses on NYC streets by NYPD. These are critically well trained animals, of course, conditioned to be non reactive to everything from parades and protesting crowds to gunfire and active duty situations. Arguably, these animals are subjected to greater stressors than their livery brethren working the relatively quiet streets around Central Park. Additionally, these critters are under the direct supervision of the Police departmental structure and by extension City Hall, which brings us back to the Mayor. 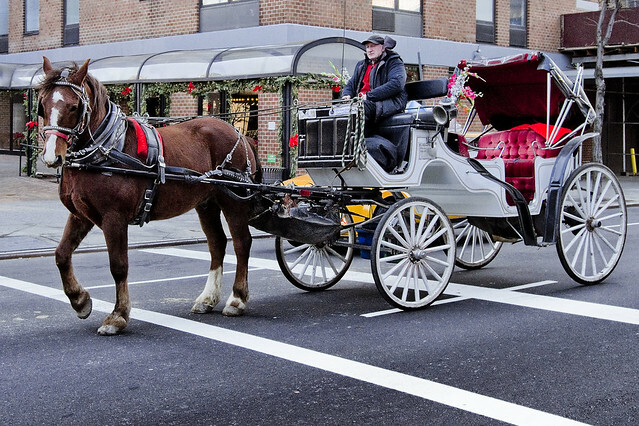 The logical extension of banning the carriage horses from NYC streets, on the grounds of animal cruelty, would demand that all horses would need to be spared these conditions, no? This is where the “X” factor mentioned above comes into play, when you’re thinking through the logic of eliminating an entire industry or just punching a guy in the nose it is wise to think about how your choice might play out. 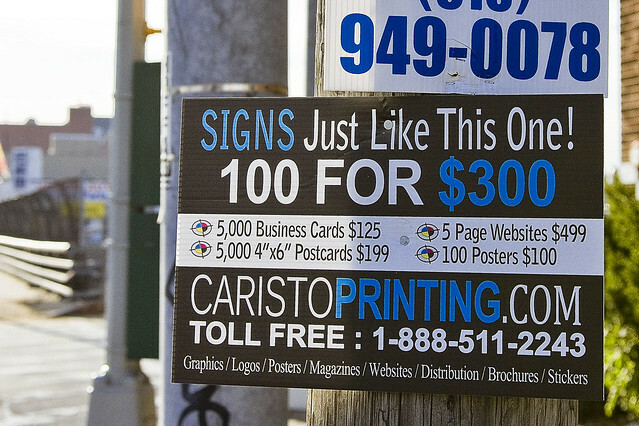 Are they ever called “on purposes”? 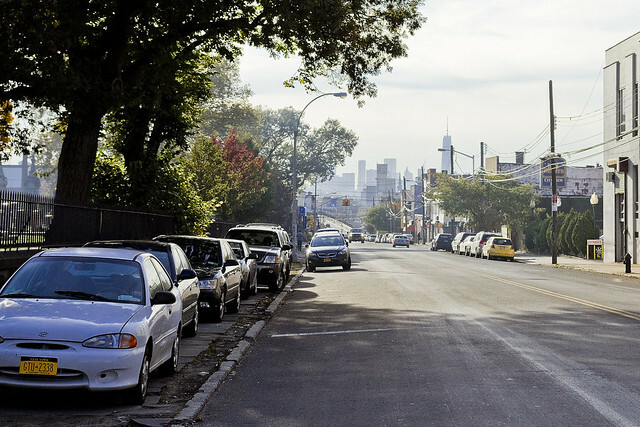 Having finally achieved landfall in… Staten Island, after a lengthy journey through the rotting tunnels of the Subway that lead from Astoria to lower Manhattan and across the harbor on the Staten Island Ferry, one was happily ensconced in an automobile when this scene was witnessed. 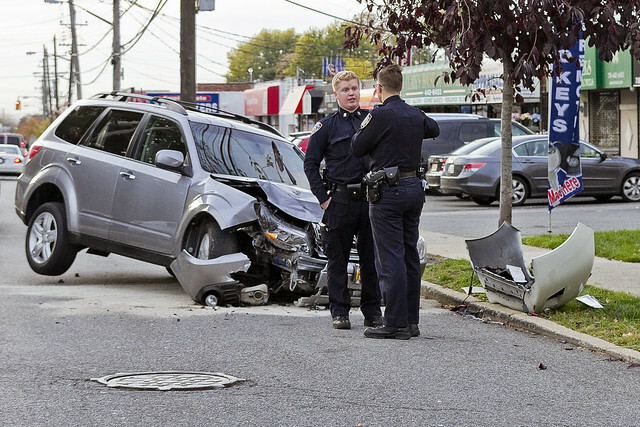 The pair of NYPD officers seemed to be discussing a recent accident. Got me to thinking about traffic, and traffic accidents. One remembers a few screw ups from when I was first licensed to drive, in particular there was a crunched door panel in a Ralph Avenue strip mall parking lot which was my fault ultimately (misjudged my turning radius) that cost an astronomical amount (to an 18 year old back in the 80’s ) for me to put right. Never experienced the sort of thing in the shot above, which still puzzles me from the physics point of view, as it would have taken a LOT of energy to get that wheel up off the ground. 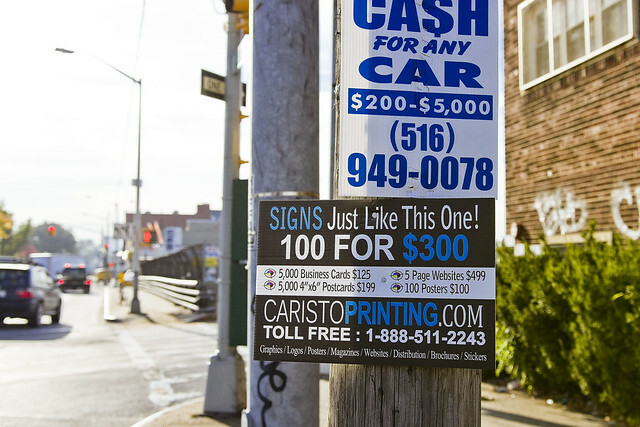 This was on Jackson Avenue in LIC, incidentally. 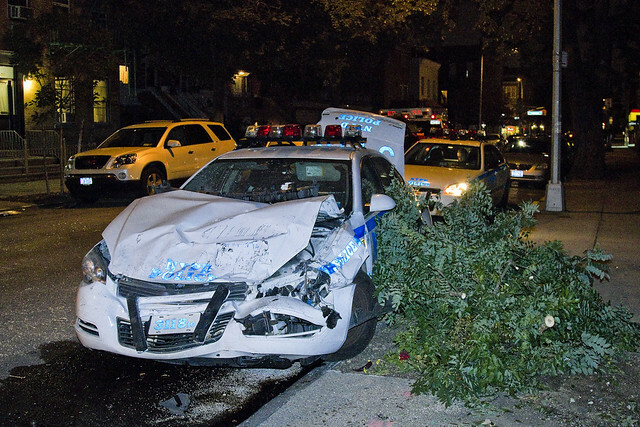 This NYPD patrol car had its lights on and was in the process of responding to a call with great haste when the officers lost control of the vehicle. 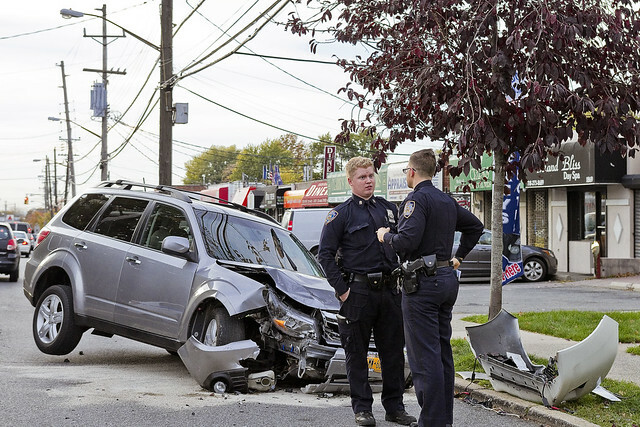 They were speeding down 44th street in Astoria and ran afoul of uneven pavement encountered when crossing Broadway. Witnesses reported that they gained altitude after their wheels hit a rise in the intersection. 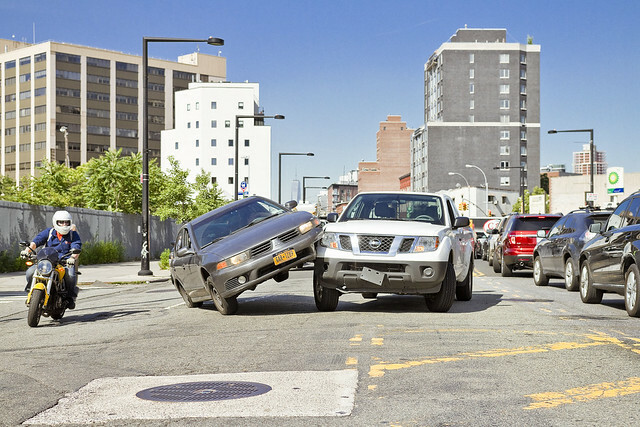 The cops totaled a parked Taxi, struck several other parked cars, and came to a halt only after smashing into a tree – which they creamed. The boys in blue, I inquired with the local Precinct Commander afterwards, had a few bangs and bruises but were ultimately ok and returned to duty shortly afterwards.